Many of the key works done by Modi government are towards the upliftment of underprivileged and less fortunates of Bharat. Among them, Ayushman Bharat-National Health Protection Mission (AB-NHPM) scheme or Pradhan Mantri Jan Arogya Yojana (PMJAY) stands apart where the poor can afford to get free health care and medical treatment in hospitals. Formally launched in September 2018, Ayushman Bharat is a National Health Protection Scheme aimed to cover over 10 crore poor families (approximately 50 crore beneficiaries) and to provide coverage upto 5 lakh rupees per family per year for secondary and tertiary care hospitalization. Its wide coverage makes it the world’s largest healthcare scheme. Many success stories of its beneficiaries started coming out soon after its implementation. Around 6.85 lakh beneficiaries have availed free hospitalisation benefits in the first 100 days of Ayushman Bharat scheme. It is targeted at poor, deprived rural families and identified occupational category of urban workers’ families. As per the Socio-Economic Caste Census (SECC) 2011 data, 8.03 crore families in rural and 2.33 crore in urban areas will be entitled to be covered under this scheme (total approx 50 crore people). Landless laborers, destitutes, chowkidars, maids and other such people will be covered. There are over 3 lakh common service centers (CSC), within the radius of 2-3 kms, which will provide information on Ayushman Bharat. At every impaneled hospital, there will volunteers, known as Pradhan Mantri Aarogya Mitra, to help the beneficiaries at every step of the scheme. Over 13,000 diseases including heart and liver ailments, cancer, tuberculosis will be covered under the scheme. Under the scheme, over 16,000 hospitals, both government and private, have been brought on-board to provide healthcare for free to beneficiaries. No hospital will be allowed to charge extra money for providing treatment for diseases covered in the scheme. In fact, a little more than 50% of the implementing hospitals, rapidly growing in numbers, are in the private sector and around 65% of total admissions in first 100 days happened in these private hospitals. Ayushman Bharat will be a paperless and cashless scheme. The E-card will have details of beneficiaries and can be used to access treatment at any impaneled hospital across India. 2,500 new modern hospitals are estimated to be built under the scheme in tier 2 and tier 3 cities, in addition to 14 new AIIMS hospitals that have already been approved. 82 new government medical colleges are also being built, which will be helpful in the smooth implementation of the scheme. The idea is to have 1 medical college in every 3-4 parliamentary constituency. The scheme will be funded 60:40 by centre and state and will be implemented through an insurance company or trust/society or both. It is indeed a positive shift to see as earlier, going for treatment in private hospitals was not a feasible option for the poor and public hospitals were overburdened. Under Ayushman Bharat, the beneficiaries are availing the medical services in private hospitals for free. The scheme focuses on catastrophic expenses that push many into deep poverty. Of course, there are the usual pitfalls that the scheme, like any Government health insurance scheme, needs to avoid – fraud & abuse through ghost beneficiaries, impersonation, over charging, unnecessary procedures etc. And since it only covers hospitalization expenses, out-patient care expenses will still need to be borne by patients, for which the public health care system has to be further strengthened. The role of Swaccha Bharat movement in improving sanitation and thus public health also should not be discounted. But there is no doubt that Ayushman Bharat has the potential to be a disrupter in the healthcare sector and the initial signs are promising. For the last 70 years the government has primarily focussed on its role as a service provider in the healthcare sector, yet public services are not strong enough and nearly 70% of health care is provided by private sector. 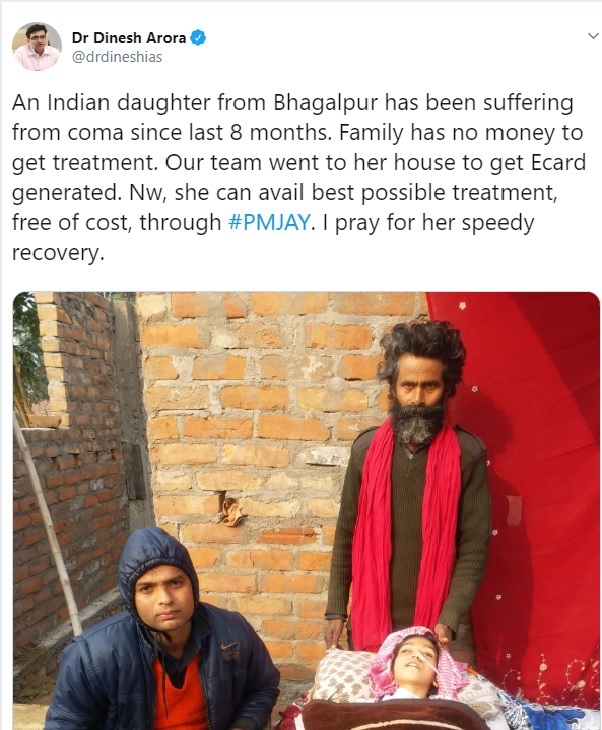 The use of private sector healthcare by the bottom 40% of the population is very very low, and this is what PM-JAY intends to change by changing the incentive structure and financing the use of private services by the bottom rung of population. There have been several heart-warming stories since the launch of Ayushman Bharat. A 54-year old street vendor in Uttar Pradesh got back on his feet after 8 years. He was suffering from a form of arthritis and affording a surgery costing Rs 1.5 Lakhs was beyond his capacity. Under Ayushman Bharat, he was treated free of cost in a Lucknow hospital. Other examples of its reach were shared by CEO Ayushman Bharat, Dr. Indu Bhushan and Deputy CEO Ayushman Bharat, Dr. Dinesh Arora. World leaders are praising and admiring the efforts and results of this path-breaking, inclusive health care scheme of Modi government where enough thought and planning has gone in to ensure proper implementation from the outset. 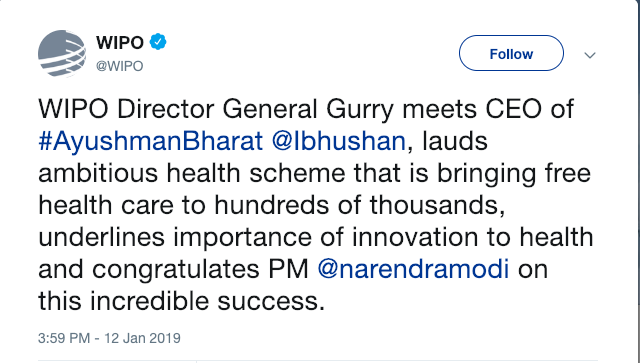 Director General of the World Health Organization, Tedros Adhanom Ghebreyesus tweeted his applause to PM Modi and Health Minister JP Nadda for their visionary leadership. West Bengal, along with Bihar and Chhattisgarh, have emerged among the largest beneficiaries of Ayushman Bharat in 2018. Out of the total government spend of Rs 798.34 crore on the scheme till November-end, West Bengal was allotted a total of Rs 193.34 crore, including Rs 16.78 crore administrative expenses, Union Minister of State for Health & Family Welfare Anupriya Patel had said earlier. Even the newly formed Congress government in Chhatisgarh has decided to pull out of Ayushman Bharat Scheme. The newly formed government is planning to devise its own universal healthcare scheme to replace Pradhan Mantri Jan Arogya Yojana (PMJAY) or Ayushman Bharat, reports Economic Times. It is sad to see that this has been done as political revenge and in a spree to blindly oppose Modi’s policies, even though they benefit the poor of the country. Such short-sighted political gamesmanship also plays into the hands of anti-national forces like Naxals, missionaries etc, who prosper when the poor are deprived of basic governanment services like health care, education etc. But maybe that deprivation & poverty is also the enabling element in the politics of ‘secular’ forces, which explains their vehement opposition to any & every scheme or initiative by Modi? 13-year-old Raped & Murdered in West Bengal – Is Media Hiding Muslim Perpetrator’s Name? Is this the Congress Way of Supporting Free Speech? Was Dhumal a victim of Internal Politics Or did he Under Estimate his Opponent ?